Home / entertainment / local news / MRFC / Muscat Daily / restaurants / It's just too hot! No blogs from me recently because I've been too busy and when I do get some time I just have had other things that I needed to get done. Usual story I guess! Muscat Daily. My local paper of choice, but what on earth is going on with it lately? Case in point: Today headlining the business section is the news that Nawras have launched corporate fixed-line services in Muscat, and linked 78 buildings in Ruwi up to their fibre network. Great news, except the key bit of information missing... the price of the services. Ho hum. 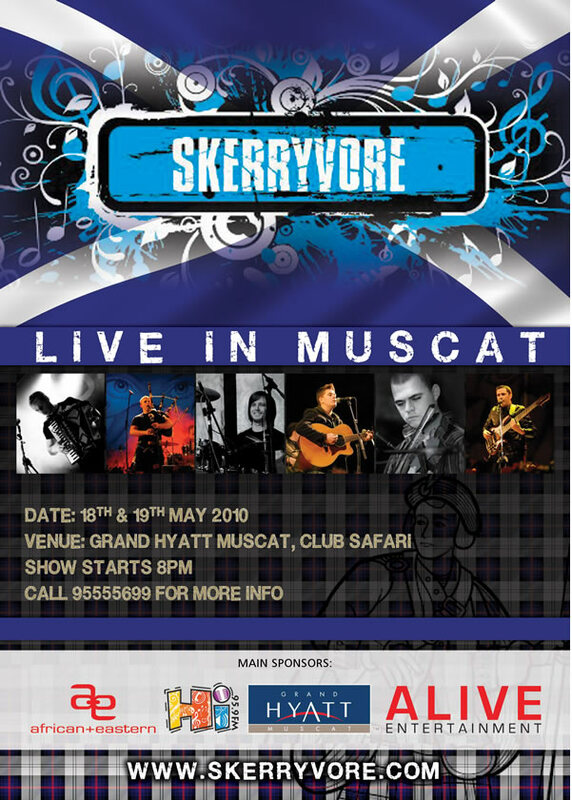 This 18th and 19th (thats Tuesday and Wednesday this week) at the Safari bar, Celtic music group, Skerryvore will be performing. You could call this an encore performance because they played here in February (25th) as well to a good crowd. So break out your kilt, whip off your undies and go and check them out. I suspect Tuesday may be a rather laid back affair and Wednesday will be the busy night. Tuesday will be free entrance, and Wednesday will cost you RO 6 on the door, with 2 free drinks. 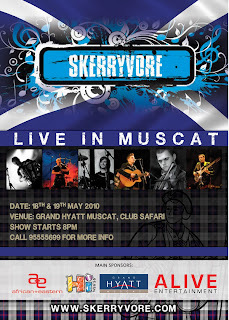 Skerryvore will be playing 2 45 minute sets on both nights, kicking things off around 9pm. And because I happen to like comedy show's, I'll take after Undercover Dragon's lead and plug the next upcoming Craic Attack: Amer Zahr on June 2nd at the Crowne Plaza. Tickets to this show will be the usual RO 15. 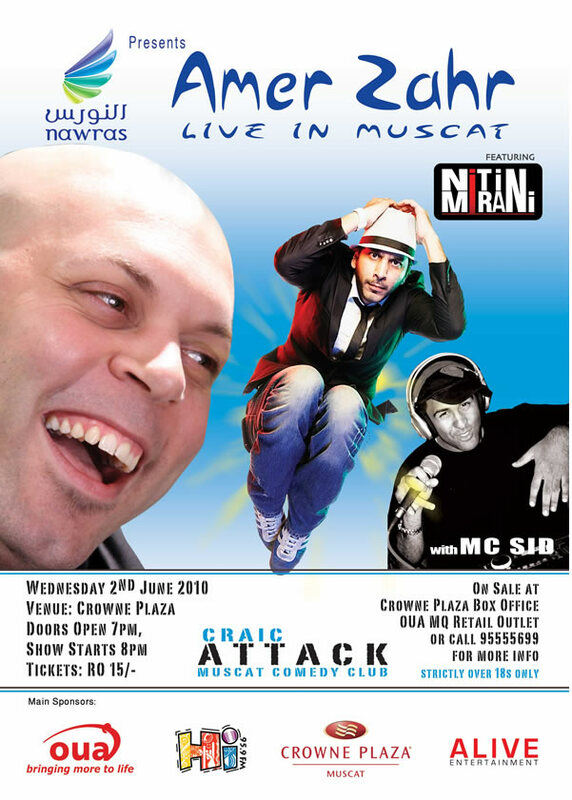 Every single one of the Craic Attack series has been hilarious, so get your tickets to continue supporting these great events. And be sure to get there early to get a decent seat - but I wouldn't sit too close to the front unless you want to heckle ;) And if RO 15 is too much for you to afford - try your luck in the prize draw on Muscat Confidential - 2 pairs of free tickets are up for grabs! Go get em! I've been collecting more amusing photo's from around town, so if you see something funny, please email it to me at my address on the top right corner of this blog. And a final question to anyone reading this - does anyone know what happened with that Shell law suit? It kind of just went really quiet, I'd love to know how that is turning out.